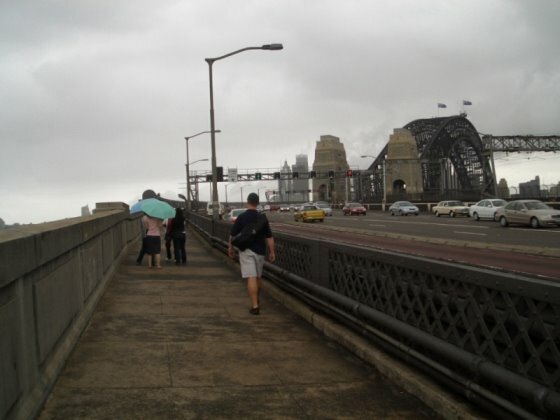 One thing MB has always wanted to do in Sydney is to walk across the Bridge, via the pedestrian walkway on the Opera House side of the Bridge. There is a Bridge Climb tour which costs an arm and a leg but MB just wanted to cross over on the public walkway. It's quite difficult finding information on accessing the walkway, I guess it's not hugely popular. Fortunately Marc knew where it started on the North side, so we drove down the hill from our apartment in Neutral Bay to Kiribilli where we found the cheapest parking so far in Sydney! The steps to the walkway begin just past Milsons Point train station. We walked across in about 20 mins, quite a few other folks doing the walk too, along with an obligatory security guard. On the city side you come out at the top of the Rocks into Cumberland St. There was a little tourist info. sign there that calls the bridge walk, the "Cahill Walk", couldn't find anything about this though in any of the tourist information flyers and books we checked beforehand. Great views from the Bridge, although it was rather overcast and drizzling when we walked across. One can really appreciate the massive size of the bridge from the walkway, makes you feel like a tiny ant.